General Description: It’s a biennial or perennial growing to 5 feet with a stout tap root. It is hairy and rough, with a somewhat woolly appearance. Plants start as a rosette (cluster of radiating leaves) of deeply lobed leaves the first year and then produce flowering stems. Flower Description: Flowerheads are solitary. Bracts at the base of heads are egg-shaped with black veins and a brown/black triangular tip with comb-like fringe along its edge. Bract tip's color gives the flower head base a spotted look. Flowers are pink purple or white. Leaf Description: Leaves vary from unlobed on the upper part of the plant to lobed on the lower part of the plant. Lobed leaves have narrow lobes on each side of the center leaf vein. Leaves are blue-gray in color and may have glands in small pits. Stem Description: Spotted knapweed stems are upright and branched, with larger plants being more branched than smaller plants. Fruit/Seed Description: Seeds are 0.1 inch (2.5 mm) long, black or brown and oval. Seeds have short bristles (pappus) on one end. Spotted knapweed is a very aggressive species that can quickly infest large areas. 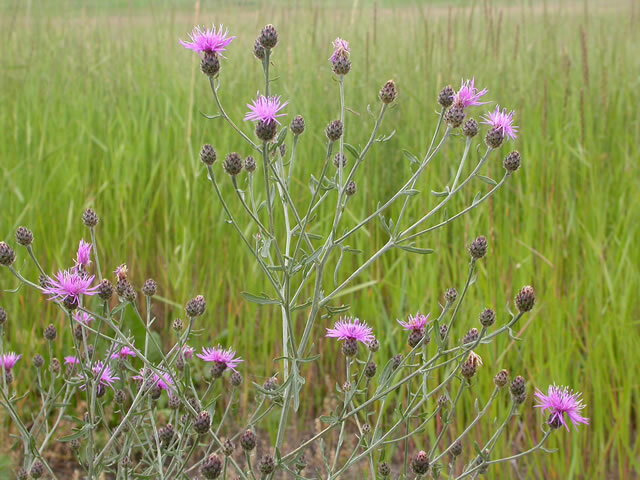 Knapweed infestations increase production costs for ranchers, degrade wildlife habitat, decrease plant diversity, increase soil erosion rate and pose wildfire hazards.